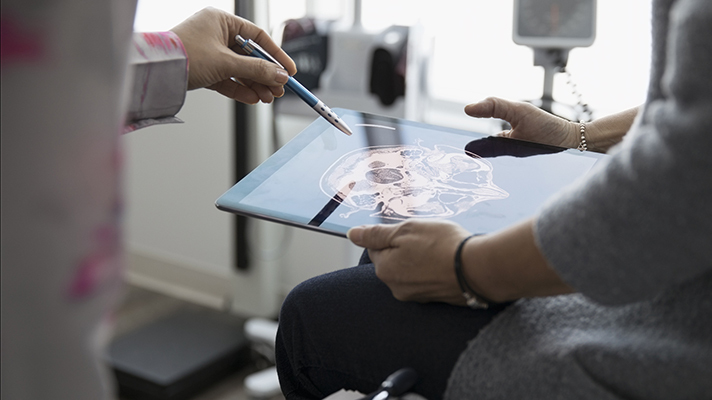 Richard Milani, MD, said healthcare is headed for big changes and the sooner hospitals and practices get on board with connected consumers and easy access to data, the better off they'll be. As chief clinical transformation officer at the pioneering Ochsner Health System near New Orleans, Richard Milani, MD, spends his time thinking about strategies and tools for care delivery improvement, both inside and outside the walls of the hospital. A cardiologist with deep expertise in medical informatics, his areas of focus include personalized medicine and population health – especially the management of chronic disease. One of the ways Milani is helping tackle those big challenges is through innovation Ochsner, or iO, a tech accelerator where, as medical director, he develops digital medicine initiatives that leverage consumer devices (Apple, Fitbit, Jawbone, etc.) to help patients stay healthy. A couple years ago, at a HIMSS event in Southeast Asia, Milani was asked to describe the future state of healthcare in three words. His impromptu choices: Omics. Tailored. Connected. "But if you asked me today, I'd probably keep two of the three the same, but instead of 'omics' I'd say ‘information,’" Milani said now. "Because it's more than omics. It's patient-generated data, social determinants, there's stuff that's inclusive, on top of omics, that is useful." The industry has spent the past decade or years "just getting to that starting point" with the heavy-lifting of EHR implementations, he said, and now there's more clinical data to work with than ever. "But there's so much other valuable information outside of that. We're just scratching the surface." At the same time, it's been said over and over again that most physicians aren't particularly interested in being deluged with a steady stream of patient-generated data. "That's why it's incumbent upon us to design algorithms to be able to curate the information to be able to make responses without it all being on the human," said Milani. "That's what information services should be doing: saying, 'OK, there's a ton of data coming in, we're going to figure out, before it even gets to the doctor, that these are the three data points you need to look at, and don't even worry about this other 450.'" At Ochsner, "we're doing all that today," he said. “We're collecting all of that stuff. From home, and everything else on a regular basis. It's not a problem. Storing the information, curating the information, doing stuff with it, is not that hard. But if all we're going to do on the IS side is say, 'OK, here's your connection,' just telling the doctor to sift through this pile of sand to find the one particle you need, that's not very fair." The second part of Milani's three-word vision of the future – "connected" – seems just as problematic. Interoperability, for all the work that's been done and continues to be done to make it work better for patients, is still a huge challenge. "I'm talking about connection to humans, to patients,” Milani said. “Obviously, we need to be connected. It's not divorced from that, but it's more than that." It goes beyond, in other words, simply having Epic link seamlessly with Cerner. "That's blocking and tackling 101," he said. "We need to be connected in multiple ways with our patients. Right now the only way we're connected with them really is with a face-to-face visit or with a message in your portal. And that's not adequate. Maybe it's adequate if you break your arm, or if you had a cold and now it's gone. But the majority of the problems we have are with chronic disease cases and the majority of those interactions are insufficient." That's a big reason Ochsner was one of the first dozen health systems to sign on with Apple's Health Records pilot. "I think it's an important milestone," said Milani. "Years from now, we'll look back and see it as a milestone." The calculus is simple, he said: "I'm a patient, you're a patient. We ought to have control of that information. And it ought to be at our fingertips, when and where you want it, and you shouldn't have to ask for it. The portal is good. But why can't I have one data dump somewhere, that I can see, and I can choose whether I want to share it with a new doctor? My choice." That's where interoperability and patient engagement are going, he said. That's the future that's going to most enable "personalized" in his three-part description. "You're going to have all of your information on some kind of device: It's portable, you carry it with you, it's secure," said Milani. "You decide what you're going to share and what you're not going to share. Epic and Cerner are still going to serve as the big box stores. Because I've got to have a system that can manage my data as a doctor at a hospital system. But there ought to be another way that you can accumulate all your data as an individual." Milani is laying out big changes for an industry that has traditionally been fairly resistant. But that change is happening now, and the sooner hospitals and health systems get on board with these new ways of thinking, the better off they'll be, he said, "whether they come kicking and screaming, or not." "It's the 21st Century," he added. "A lot of doctors may grumble, but it's like stopping the Internet. 'I don't like email.' Well, OK. There's a lot of things people may not like, but it is what it is. I think it's inevitable. I really do. I just can't imagine any other way about it." In the opening keynote the HIMSS Precision Medicine Summit in Washington on May 17, Milani will offer insights to the work being done at Ochsner to optimize its information systems and decision support capabilities, and to drive innovation patient engagement projects, tailored to reach them where they are. He'll also explain how these are the major imperatives for all healthcare organizations, who should embrace the future now by thinking more creatively about the connected patient. Accelerating precision medicine to the point of care is focus of summit in Washington, D.C. May 17-18.